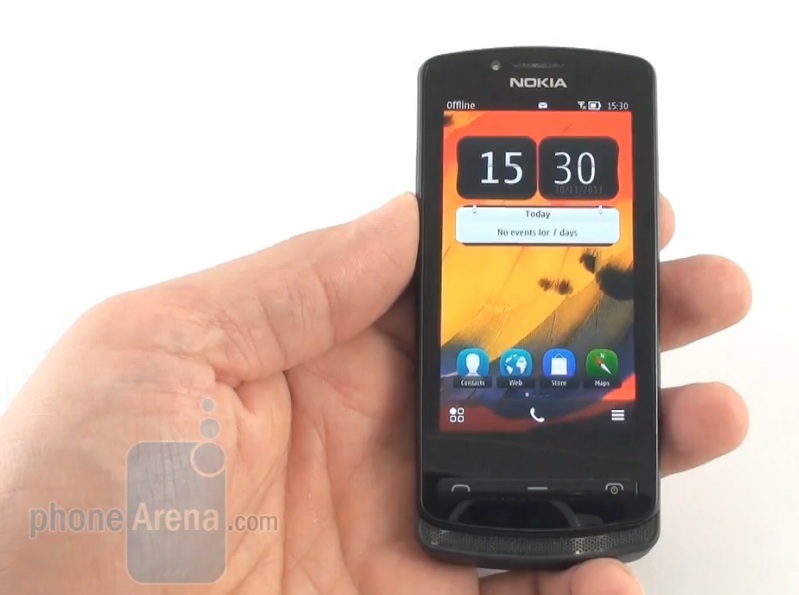 PhoneArena have published their video and written review of the Symbian Belle packing Nokia 700. Clear black display very nice saturated colours, great contrast and very decent viewing angles. PPI of 220 apparently very good too. Symbian Belle talked about before (in 701) and hardware noted as identical (in terms of running the phone). They say it’s enough for fluid scrolling and swiping throughout the interface – the only delay being on widgets and starting a heavy app. Portrait keyboard not very comfortable to type on but landscape very ergonomic. Belle browser fluid enough, but pinch zooming is choppy compared to other mid-range handsets – otherwise a pretty functional browser. No full Adobe flash, so no flash games or streaming videos from certain flash sites, otherwise decent browser. Photo editor, pretty rich functionality as does camera. Pictures way too out of focus and not enough detail. Close ups as expected from full focus, colour representation is accurate and good exposure. 720p video is very fluid though a lot of artefacts, darker than actual scene and decimating detail.